UPDATE: Extensions of moratorium periods – how can you challenge? The following article by Financial Crime and POCA specialist Barnaby Hone is an update from a previous article on the subject he published in April this year. 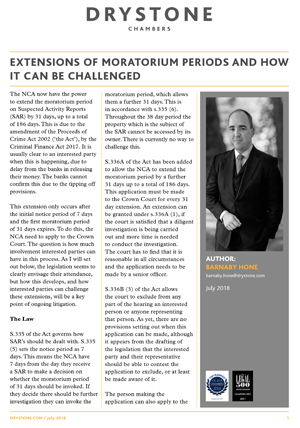 This commentary piece explains the new powers prosecution authorities can utilise to extend the moratorium period on Suspected Activity Reports (SARs). Following amendments made to the Proceeds of Crime Act 2002 by the Criminal Finance Act 2017, prosecutors can extend the moratorium period up to a total of 186 days. Barnaby outlines the law and anticipated points of issue, whilst explaining what the prosecution need to do to persuade the court that there are ‘reasonable grounds’ to extend the moratorium period. Barnaby is hosting a Criminal Finance Act update seminar at Drystone Chambers on Tuesday 11th September 2018, starting at 6pm. He will discuss where the headline changes in the way we are regulated occur, how the various provisions of the Criminal Finance Act 2017 have been used, provide some hints on tips on how to deal with cases where these provisions are used, and finally will discuss how he expects the provisions to be developed. Places are limited, so pre-registration is required. To register your interest and reserve a place, email our Marketing Director Brett Carver (brett.carver@drystone.com).